In Session: 12 September meeting of Hackney’s pensions committee. Photograph: Hackney Citizen. Hackney Council has reported itself to the Pensions Regulator (tPR) for statutory breach of its public service code of practice for the third year running. Under the code, all members of Hackney’s pension fund must receive annual benefit statements (ABS). tPR describes ABS as essential forecasts of the state of a member’s pension at retirement age, allowing people to effectively plan or make decisions about retirement. This resulted in the council having to report itself to tPR for non-compliance for the third year running, with nearly 7,000 statements to be sent out late, amounting to around 90 per cent of active members’ ABS still to be worked through. No fines were imposed on Hackney Council by tPR for the breach. 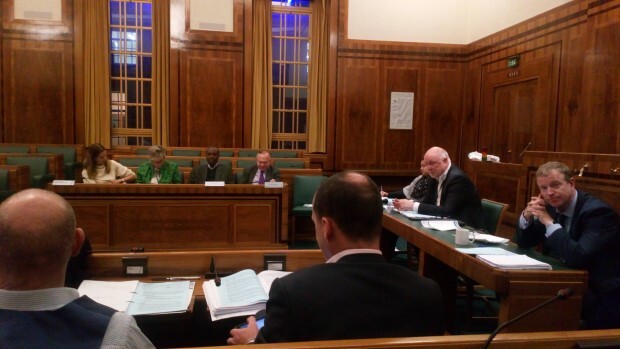 Rachel Cowburn, Hackney’s head of pension fund investment, explained to the 12 September meeting of the council’s pensions committee that this was due to continuing technical problems with the interface between the council’s iTrent payroll system and pension administrators Equiniti. Cowburn said: “We’ve had a number of meetings over the last few months with a view to collating the data from these statements. “We’ve made good progress from where we were last autumn, but we are in a transitional stage. The council was part of a minority of employers contributing to the fund which did not provide data in time to release ABS to its members. In the 2017-18 annual report on the pensions committee, Ian Williams, Hackney’s group director of finance & corporate resources, noted that the problems were not likely to improve in the near future. Williams said: “Hackney Council’s failure to submit timely data continues to cause significant problems, as the council is by far the [pension] fund’s largest employer. “Officers of the fund will make a report to the regulator detailing the issues experienced around receipt of timely and accurate data. “This is the fourth year running that such a report has been made, highlighting the long running nature of the council’s problems with local government pension scheme data provision.